The Art of "Quotemanship" and "Misquotemanship" | Quoting people accurately is really hard — and you can quote me on that. The Art of "Quotemanship" and "Misquotemanship"
Quoting people accurately is really hard — and you can quote me on that. However, Candidate Trump–eager to trumpet aggressiveness–ignored the source of the quote. It is widely attributed to Benito Mussolini (1883-1945), the brutal fascist Italian leader. 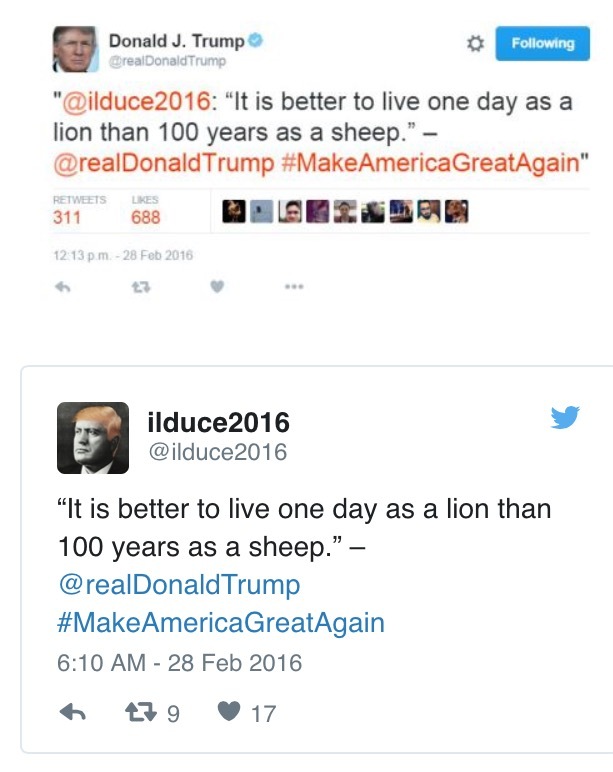 The tip-off to Candidate Trump, as you can see in the Tweet and the Re-Tweet pictured here, should have been that the quotation came to him from something called “ilduce2016”. That should have raised an eyebrow. Again, as is the case in many “too good to be true” quotes, Candidate Trump should have taken a moment to learn more about it. 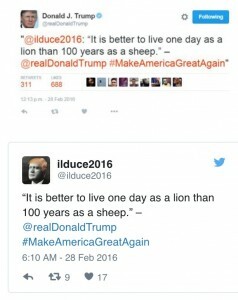 For the record, Il Duce was not exactly a “lion,” certainly not at the end when he tried to sneak across the border to safety–not as a wolf in sheep’s clothing, rather as a dictator in a German soldier’s clothing. Check out entry No. 9 on this site at History.com. This conjunction is hard to imagine–Donald Trump, Sarah Palin and Mohandas Gandhi sharing space in one Facebook-post-turned-Tweet. 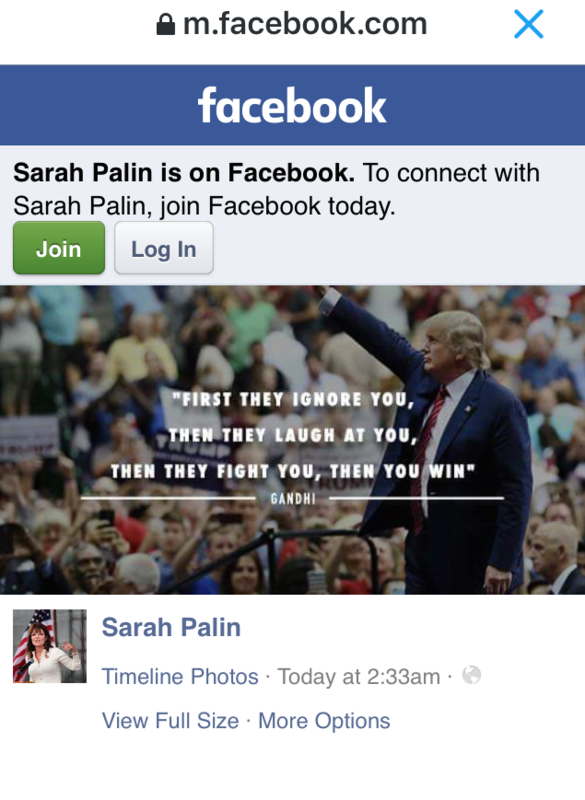 Evidently, Mrs. Palin, the erstwhile governor of Alaska, has Facebooked (at 2:33 a.m. on February 25) an artful presentation of a quotation widely attributed to Gandhi over a picture of Trump waving to a host of clicking admirers. Palin can use Facebook. That’s great. Can she use Google or Bing? Can she stop and think? It’s so easy to check stuff out these days. A couple of keystrokes present the likely origin of the quotation. It is NOT from the mind of Gandhi. Klein, from Cincinnati, spoke before the ACWA on May 15, 1918, in Baltimore, Maryland. The Christian Science Monitor covered this adequately in 2011. This is a classic mess. The quotation is misunderstood, misattributed, and misappropriated. Nothing is right here. Gandhi is not Trump. Gandhi did not say that. No one has ever ignored Trump. Well, this stamp needs some kind of “return to sender” applied. Post writer Lonnie O’Neal (with the help from longtime quote-collector and Emerson College professor Jabari Asim) writes that the statement most likely originated with Joan Walsh Anglund, an author of children’s books. As the Post points out today, the statement appears on Page 15 of Angland’s book A Cup of Sun, published in 1967. Be Careful When Comparing Quotations. Context Matters. And Video Helps. Today’s inky version of the Boston Globe devoted plenty of space to the debate between the two major candidates for governor of Massachusetts that took place in Worcester last night (Oct. 27). 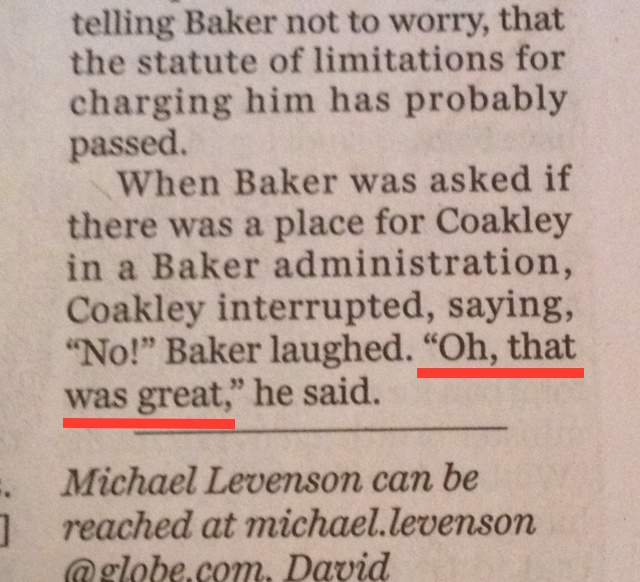 The coverage of the Charlie Baker/Martha Coakley tussle looked thorough and robust. And the Globe obviously deemed the debate important. The news article began on the front page. One itsy, bitsy portion of the coverage puzzled me at first, however. 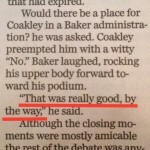 The way it appears in print, a comment by Charlie Baker differs in the straight-news report of the debate and an analysis of the debate (both of which appear on Page A8). The sections in question are at right. For context, at one point moderator Latoyia Edwards of NECN asked Baker if there would be a place for Martha Coakley in his administration should he win next Tuesday’s election. I’m left wondering: What did he really say? There’s a possibility he said both. And that, in fact, is what happened. So, the quotations are BOTH correct. One can only see that from the video. The limitations of the ink coverage doesn’t really come into play in that one. In another item that came up, however, the limitations are clear. As part of a sequence of questions requiring only a “yes” or “no” answer, Edwards asked the candidates whether or not illegal immigrants should get drivers licenses. Coakley demurred and said, “I don’t know yet” and said she didn’t want to answer a question that “can’t be answered yes or no.” She elicited groans from the audience. 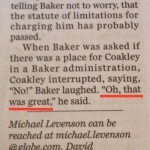 Baker quickly said, “No.” He got five seconds of pretty loud cheering from the audience, which was in the Hanover Theatre for the Performing Arts. NOTE 1: I’m still a little puzzled that the Herald included nothing at all in the printed version I bought in Winchester. Time couldn’t have been the main reason. After all, the Herald included an article about the Monday Night Football game between the Cowboys and Redskins, er, team from Washington. 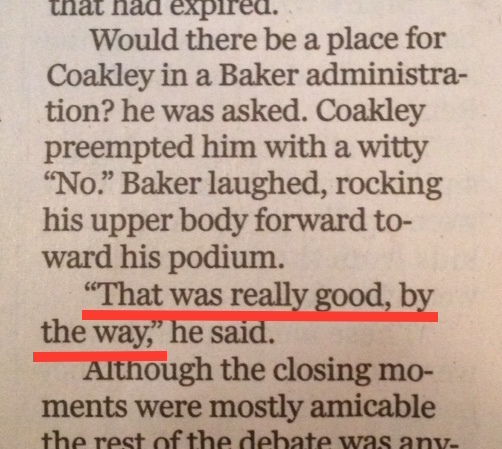 NOTE 2: Neither Globe story had a Worcester dateline, which tells me the paper did not send anybody to the debate. They watched it on television. Interestingly, the news analysis pointed out that Worcester is “an area of the state whose voters often feel neglected by the Boston-centric political establishment.” Right. And it looks like you can add the Globe to that group that conveys a feeling of neglect! The Sydney (Australia) Morning Herald from this morning [meaning October 15] has a piece on the crisis at Kobane, which is on the border that separates Syria and Turkey. 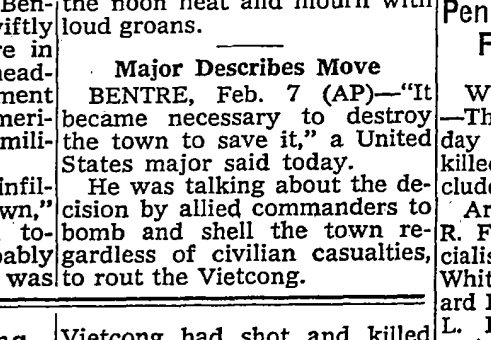 From the New York Times, Feb. 8, 1968, page 14. 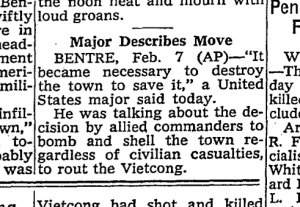 The statement often appears as something like “We had to destroy the village in order to save it.” While some question the authenticity of the original reporting, the statement entered the lexicon in various forms. Glad that the original as-it-first-appeared-in-print comment remains in play here in Australia. Would rather that someone would finally come clean about the original statement. If so, who said it? Then, let them trademark it. It has legs. What’s the Best Environment for the Survival of a Darwin ‘Quotation’? They need a good environment in which to thrive. First of all, kudos to her for writing that Darwin did not say this. However, it really is not a misquote. Although the statement, which lies in innumerable business-conference Powerpoint presentations, expresses a wonderful point about the importance of adaptability, Darwin never said this, exactly. 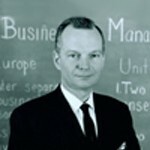 It was actually said by Professor Leon C. Megginson, but that really won’t get anyone’s attention, will it? Of course, the misquotation lives on, and on, and on. It’s not surprising that the Waterloo paper presented it, and kept Darwin’s name stuck to it. After all, the words will live a LOT LONGER in the mouth of Darwin than in the mouth of Megginson, a longtime (and quite revered) professor at Lousiana State University. And people easily adapt. They use it–Joyce Hodge is not alone–even though they know that Darwin never said it. Apparently, What’s Good for the Misquoter is Good for the Paraphraser. And Vice Versa. Sometimes a misquotation is so entrenched that it becomes strangely acceptable to paraphrase the misquote..
That’s what happened in the 12 September 2014 editions of The Daily Telegraph of Sydney (Australia). 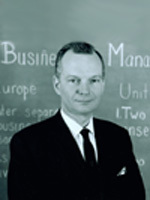 One of the most famous misquotations in history is often attributed to Charles Erwin Wilson, a former president of General Motors who became the U.S. Secretary of Defence in 1953. 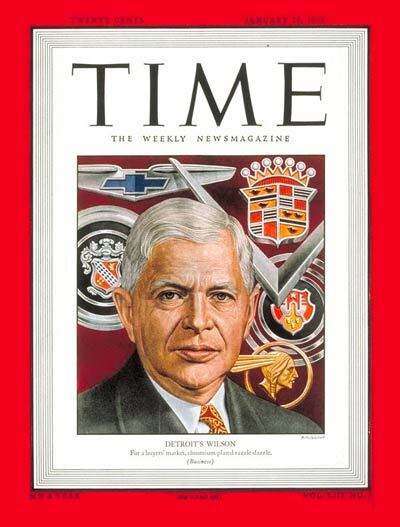 At the time of his appointment Wilson was supposed to have said: “What’s good for General Motors is good for the country.” His actual words were significantly different, but the misquote lives on. To paraphrase Wilson, what’s good for NSW is very definitely good for Australia….blah, blah, blah. 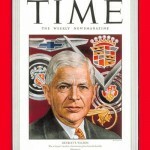 The writer established that Wilson’s statement is often misquoted. Great. Furthermore, they write, Wilson’s “actual words” were “significantly different.” Great. Also, they add, “the misquote lives on.” So far, so good. Where are they going with this? Will the writer correct the record and give Wilson’s “actual words”? The writer heads in another direction. They ease it into first gear and step on the gas, plunging ahead. He or she takes the misquote, acknowledges it as a misquote and then uses it as the takeoff point for the editorial–following the same rut in the road that many. Yes, indeed, it is a shame that “the misquote lives on.” The writer, acknowledging that fact, then adds to the longevity. The editorialist simply could not resist using the common “what’s good for X is good for Y” formula. That’s all that many people needed to hear, and that early twisted, shorthanded, hearsay version became a staple anti-business commentary. It is, after all, a wonderful embodiment of a patronizing attitude of a self-centered wealthy businessman and corporate leader. Too bad it misrepresented the statement of “Engine Charlie.” And jump-started a hard-to-kill misquotation. 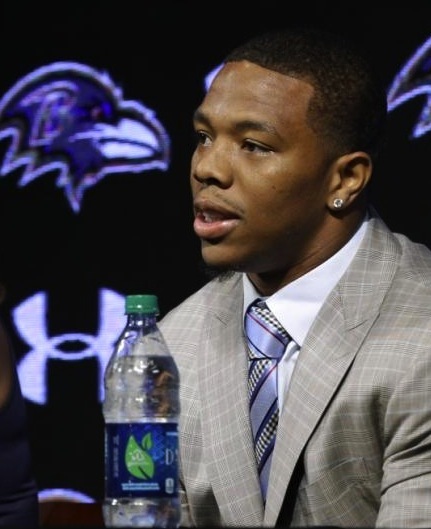 Disgraced Baltimore Ravens running back Ray Rice, speaking at a May 23 press conference in Maryland. 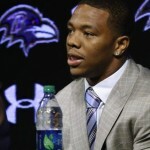 This week’s news has brought more attention to former Baltimore Ravens running back Ray Rice’s May 23 press conference. That’s where he tried to offer a life-lesson but did it in an oafish manner. The context? You likely know it: He and his wife explained some of what happened in and near that elevator in Atlantic City in February. Whatever did happen (which was not widely known on May 23) was that he dragged his soon-to-be-wife out of an elevator after some kind of altercation that left her knocked out, cold. That’s exactly how he said it. It’s about 1:55 into the video that’s part of a transcript put together that day by the Baltimore Sun newspaper. News coverage was vast. But that day a word crept into the statement (a problem)–and the two “you know” fillers were taken out (not a problem). Reports from 23 May by numerous outlets (including Reuters and Fox Sports, for instance) added a word, changing the last clause from “it’s not getting up” to “it’s not getting back up” [emphasis added]. I know. It really doesn’t change the meaning. One trouble, however, is that the added “back” lingers. Articles posted online by Vanity Fair and Mother Jones on 8 September include the added word. That’s too bad because it’s easy enough to check the transcript and compare it to the video of the news conference. Takes a couple of minutes. But, for some reason, many journalists assume a quote is accurate and aren’t particularly interest in checking the accuracy and context. Even when a simple Google search reveals variations and a source of accuracy is available. 13,300 hits: For a search that included the phrases “ray rice” “not getting knocked down” “not getting up”. 3,800 hits: For a search that included the phrases “ray rice” “not getting knocked down” “not getting back up”. Surely that principle has been hollared many times by many football coaches. Was it drilled so deeply into Rice’s brain that he didn’t realize that the “knocked down” reference was totally inappropriate for a news conference dealing with the events that led to the KO of his fiancee? Of course, quotations are properly handled the vast majority of the time. Yesterday, recently retired Pittsburgh Steeler football player James Harrison did this in a Tweet that tweaked National Football League Commissioner Roger Goodell. The commissioner is under fire for his handling of football player Ray Rice’s elevator punch-out of his then fiancee, Janay. 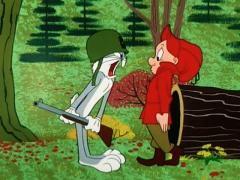 ain’t no fun when the rabbit got the gun huh? It has been retweeted tens of thousands of time. Harrison’s Tweet is beautifully succinct. Even though there were no quotation marks, I wondered about any source of the statement. 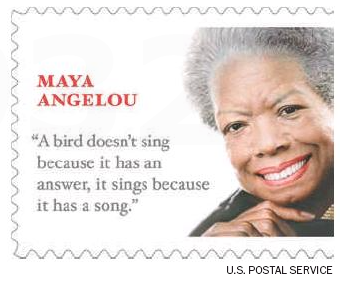 Granted, he’s passing on a fairly common “proverb,” but this got me hunting for a source in popular culture. 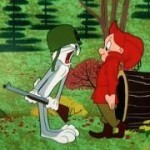 With a fond nod to rabbit hunter Elmer Fudd and his wily prey Bugs Bunny (right), this is an accurate quotation from, among other places, Write Where I Left Off by American rapper Ras Kass (aka John Austin IV). (I won’t bother with the context because I’d have to use the N-word, which is in the previous line.) For the record, I think L’il Wayne in My Birthday had the same line. In any case, some people are aiming something at Goodell. As Harrison points out, this turns the tables on him. Until now he has enjoyed the reputation of being somewhat of a sheriff. The coverage reveals an inescapable journalistic fact: Quoting people accurately is difficult. So, what’s different in these presentations, each of which is less than 30 words? 3. The Herald says “Seriously fed up”; the Globe omits the phrase. On the NECN site, the video of Moulton’s quoted portion begins at the 1:18 mark and ends at 1:35. From this we can see exactly what Moulton said and evaluate the reporing. 2. The gridlock. 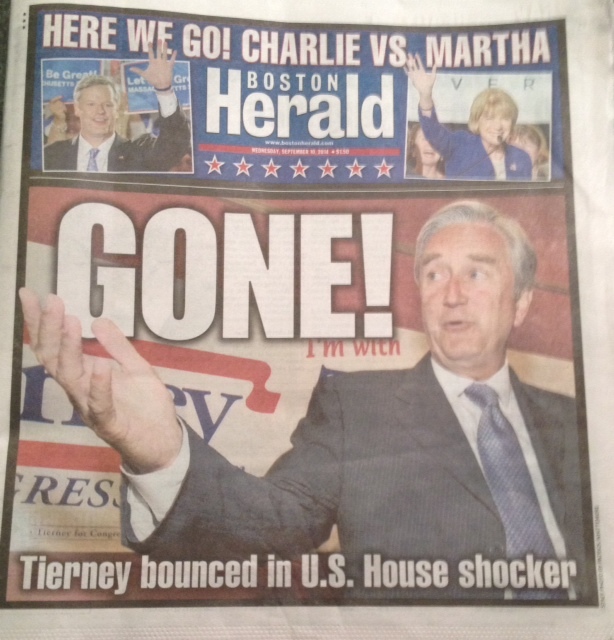 Moulton said “gridlock in Washington,” so score one for the Globe. There’s no reason for the Herald report to have “Congress,” although the two words are interchangeable to many these days. Does Congress=Washington. No. Ask anyone living in Anacostia. 3. The “fed up” phrase. Here, the Herald got it right. Moulton did say “seriously fed up.” The trouble for any reporter at the event is that the comment is very hard to hear. 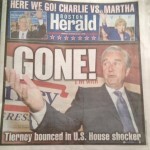 The listeners devoured Moulton’s “we’re fed up with gridlock in Washington” comment. Yes, they ate it up. And they hungrily erupted in cheers. This which overwhelmed Moulton’s three-word phrase. I heard it on the tape only because I was listening for it. I understand how the Globe reporter missed it. But the Herald reporter, to his or her credit, got it. Does any of this matter? None of the changes are damaging, really. They all likely fall in the “no harm, no foul” category. But changing a word (Washington to Congress) and omitting a phrase are dangerous transgressions. The double-quote mark tells the reader that this is EXACTLY what was said. It’s hard to get it right sometimes. But it’s worth the effort.